Bob Bushnell, Fender bass; Frankie Jones, drums; Buddy Caldwell, conga. Over the years I've heard Houston Person as a member of Johnny Smith's band, with his own group, on record, radio & TV. I've come to dig him as a good cat and valid musician with a great deal to offer. I once asked Houston, if he were a writer, how he would describe his playing at this point in his career. "Well I'll tell ya," he said, "it's sort of a modern old-time thing." Well said. Houston has a great deal of respect for classic standards and blues. These form the main planks in his musical platform. In fact this album is a good example of what he means. The opener is "Hey Driver!," a bright boogaloo thing that has Person and drummer Frankie Jones sharing the brief vocal. This tune was written by organist Gloria Coleman who has been a part of the Person group in recent months. Up next is "Goodness," the title tune. This is a walkin' blues with Fender man Bob Bushnell and congero Buddy Caldwell leading the way. Houston really stretches here and it is one of his longest and loosest solos on record. "Brother H" [mp3] is a shuffle blues in B flat. 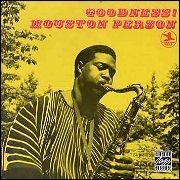 Houston digs playing this type of thing and his last LP Soul Dance (Prestige 7621) contained a tune called "Snake Eyes" which was in a similar vein. "Hard Times" is the first tune up on side B. This was a hit for David "Fathead" Newman several years back but I think Houston adds something all his own. Listen to that big huge sound! "Jamilah" is by the organist on the date, Sonny Phillips. Like Person, Phillips gigged around Boston for a few years and for several months was a part of a successful duo (with drummer Leo Stevens) at Estelle's. The tune is quite melodic and again utilizes the contemporary boogaloo rhythm. "Close Your Eyes" is not the version which most listeners recall. This melody was written by the late Chuck Willis and was a big R&B hit for the Five Keys. Billy Butler, one of our great guitarists, states the melody while Houston provides the counter lines. Houston and Butler have collaborated before on Butler's Prestige LP This Is Billy Butler (Prestige 7622). So what we have in this LP is "modern old-time" Houston Person. Four new melodies and two older ones make for the kind of goodness which Houston Person dispenses with regularity. --BILL BUCHANAN, from the liner notes.